Satisfy your inner culture vulture at Heidelberg Castle (Schloss Heidelberg) and Marienburg Fortress. Head to maennERsache and Kleinmarkthalle Frankfurtfor some retail therapy. Venture out of the city with trips to Heidelberg (Altstadt (Old Town) & Carl Theodor Old Bridge (Alte Brucke)), Wurzburg (Würzburg Residence, Frankoniabrunnen, & more) and Messel Pit Fossil Site (in Darmstadt). There's lots more to do: explore the world behind art at Städel, make a trip to Frankfurt am Main Hauptbahnhof, admire the landmark architecture of Opernturm, and take in the spiritual surroundings of Cathedral of St. Bartholomew (Dom St. Bartholomaus). For traveler tips, more things to do, maps, and other tourist information, refer to the Frankfurt trip planner . If you are flying in from Germany, the closest major airports are Frankfurt am Main Airport, Frankfurt-Hahn Airport and Cologne Bonn Airport. January in Frankfurt sees daily highs of 6°C and lows of 0°C at night. Cap off your sightseeing on the 28th (Sun) early enough to travel to Hanoi. Satisfy your inner culture vulture at Ho Chi Minh Mausoleum and Vietnam Museum of Ethnology. Give yourself a bit of retail therapy at 54 Traditions Gallery and Indigo Store. Pamper yourself for a day on the 1st (Thu) at some of the top local wellness centers. And it doesn't end there: get to know the fascinating history of Old Quarter, take in the spiritual surroundings of Temple of Literature & National University, explore the world behind art at Ho Chi Minh Museum, and indulge your taste buds at Food & Drink. 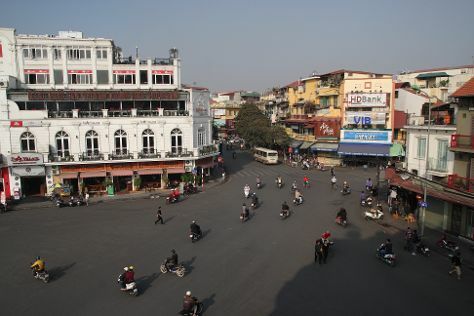 To find ratings, where to stay, other places to visit, and tourist information, refer to the Hanoi trip planner . You can fly from Frankfurt to Hanoi in 14.5 hours. The time zone difference when traveling from Frankfurt to Hanoi is 6 hours. Finish up your sightseeing early on the 2nd (Fri) so you can travel to Taipei. Deepen your sense of the past at sights like Chiufen (Jiufen Old Street) and 2/28 Peace Park. Do some cultural sightseeing at National Palace Museum and Confucius Temple. Go for a jaunt from Taipei to Xinbei to see The Lin Family Mansion and Garden about 30 minutes away. Next up on the itinerary: buy something for everyone on your list at Taipei 101, get a taste of the local shopping with Eslite Bookstore - Xinyi, get engrossed in the history at National Dr. Sun Yat-sen Memorial Hall, and stop by Ximen Red House - Ximending. To find more things to do, photos, reviews, and more tourist information, go to the Taipei journey planner. Traveling by flight from Hanoi to Taipei takes 7 hours. Alternatively, you can do a combination of car and ferry. Due to the time zone difference, you'll lose 1 hour traveling from Hanoi to Taipei. In February, daytime highs in Taipei are 23°C, while nighttime lows are 16°C. Wrap up your sightseeing by early afternoon on the 8th (Thu) to allow time for travel back home.